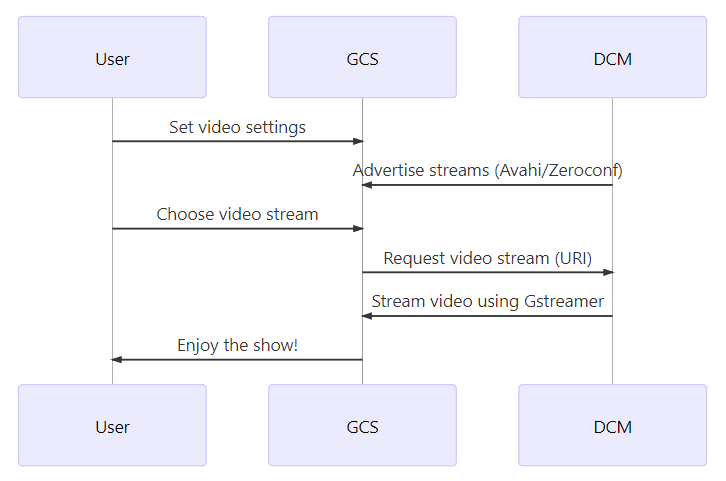 The diagram below shows the common sequence for advertising and accessing RTSP video streams. In order to use this service DCM must be built with Avahi enabled. The Avahi implementation of the Zeroconf protocol is used to advertise available video streams. All streams are published as RTPS services with path, ip and port necessary to access the resource. Extra information about video is published using txt-record field from the Avahi resource. See also Manual Tests > List Available Streams with Avahi for a similar example using avahi-browse -r _rtsp._udp. The Camera Manager uses GStreamer RTSP servers to handle video streaming. The streams are accessed using a RTSP URI created using the information from zeroconf output. ADDRESS is the hostname or IP of the remote server, informed in zeroconf IP field. PORT is the port of the RTSP server, informed in zeroconf port field. VIDEO_STREAM_ID is the name of the video stream, informed in zeroconf name field. rtsp://192.168.1.1:8554/video0 Play video0 stream using default configuration. rtsp://192.168.1.1:8554/video1?format=YUYV&width=800&height=600 Play video1 stream using default configuration because 800x600 resolution is not available for format YUYV.